Shortly before I picked up this issue of TEEN TITANS at my local 7-11, the Six Million Dollar Man aired its well-remembered Venus Space Probe episode. I only mention this to give some sense of the cultural landscape to those who weren’t around back then. SMDM and its sister show the Bionic Woman were among the very few quasi-super hero/fantasy/adventure programs around at that point, so even when they weren’t very good, because the number of choices was so limited, we watched them anyway. (The Fembots on Bionic Woman creeped me the hell out.) If comics and comics-related media was your thing, not only were you likely to be ostracized, you also had a very limited menu from which to choose. 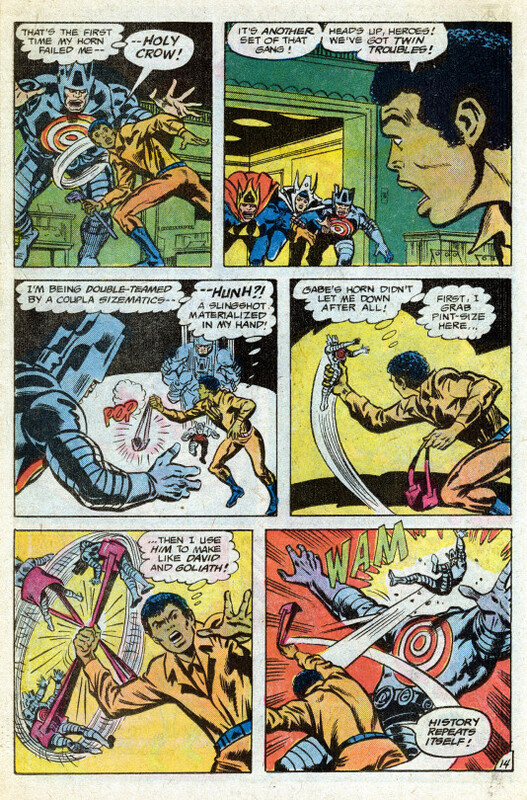 TEEN TITANS was a troubled production in the 1970s, launched haphazardly and immediately switching editors and creative teams mid-stream. This meant that certain plotlines (the evolution of Mal into the Guardian) took an abrupt right turn. Additionally, it seemed like there was a new artist every other issue or so. 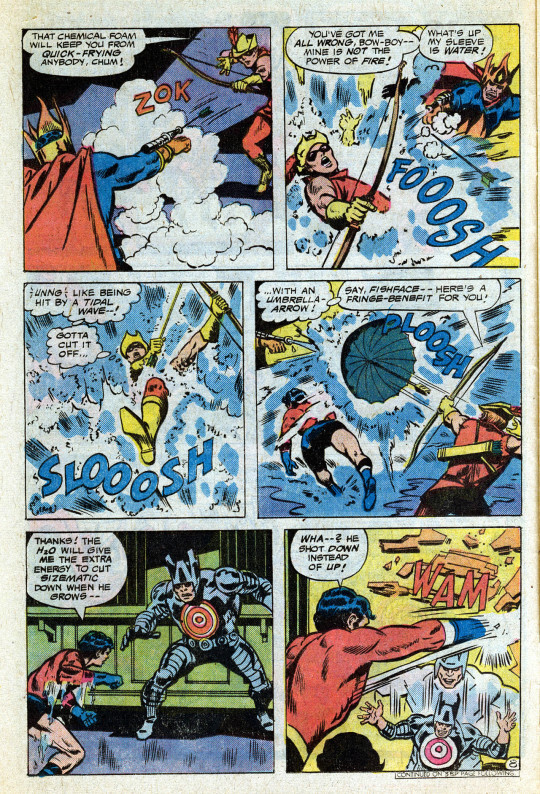 This particular issue was drawn by Bob Brown, a longtime journeyman artist best remembered for a long run on Challengers of the Unknown; he also did a number of Avengers issues during Steve Englehart’s run. 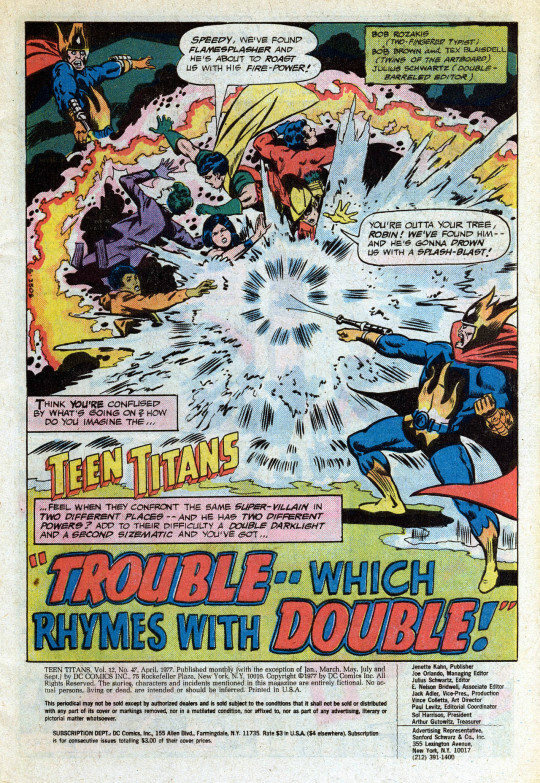 The issue opens with simultaneous crimes taking place in both New York City and Gotham by two trios of identical super-villains: Flamesplasher, Darklight and Sizematic. 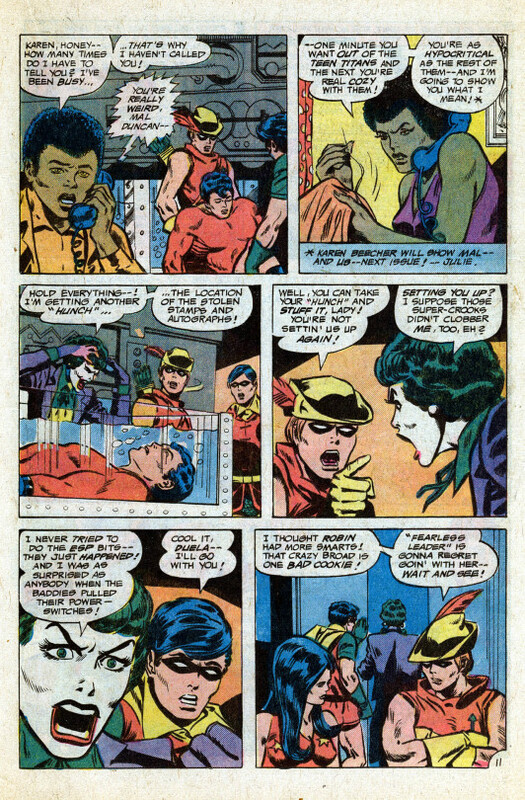 But in Gotham, the Teen titans are on the scene–but they are quickly outperformed by the villains, who escape with their ill-gotten gains.Meanwhile, Speedy, Aqualad and Mal are seeing to the preparations for the opening of Gabriel’s Horn, the nightspot that will also double as the Titan’s headquarters. As te defeated Titans return from their failed mission, the Joker’s Daughter gets another mysterious psychic premonition of a crime that’s about to occur, and the team sets off for a bank in New York. There, they discover the same trio of criminals–but when the Titans engage them, their powers are all different from the guys they’d fought earlier: Flamesplasher shoots water, not fire, for example, and Sizematic shrinks rather than grows. Off-balance due to this switch-up, the Titans are again clobbered by the baddies. Back at Gabriel’s Horn, there are angry words and recriminations. Speedy in particular doesn’t trust the Joker’s Daughter, thinking that she’s been setting the team up by feeding them bogus information about their foes. So when JD gets another psychic hunch concerning the whereabouts of the Titans’ foes, only Robin is willing to accompany her. At the same time, Aqualad has come down with a bad case of Hydro-Asian Flu, which requires that he rest in a tank full of distilled water or he’ll die. He’ll be laid up from this malady in one way or another until the series runs its course in half-a-dozen more issues. Checking out the news, the Titans are alerted to another theft in progress. Racing to the site, they find themselves caught between both sets of their trio of enemies. 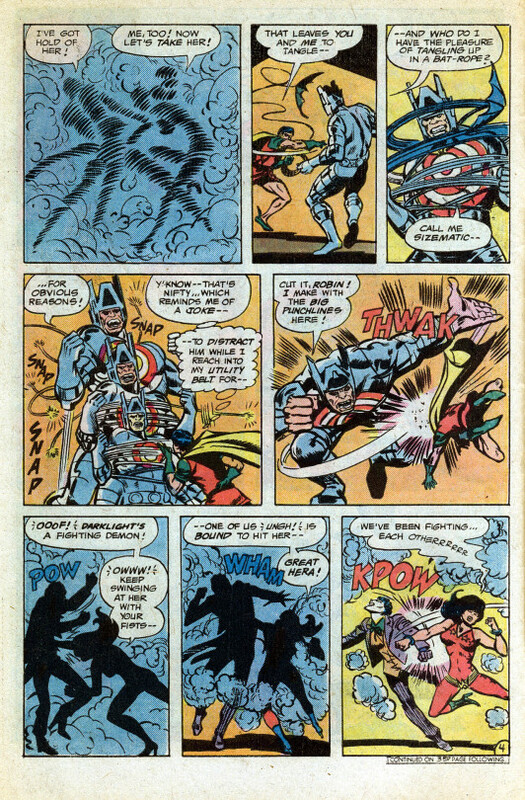 But this time, the Titans have their act together, and they take down the six villains without much of a problem. Yay, Titans! Back at Gabriel’s Horn, Speedy crows about the fact that they were smart enough not to fall for the Joker’s Daughter’s ruse to lure them away–overlooking the fact that the Titans haven’t heard from Robin or JD since they headed out. And for good reason! Because as the issue wraps up, we find Robin and JD having been captured by the mastermind behind these twin crimes, Batman’s old enemy Two-Face. 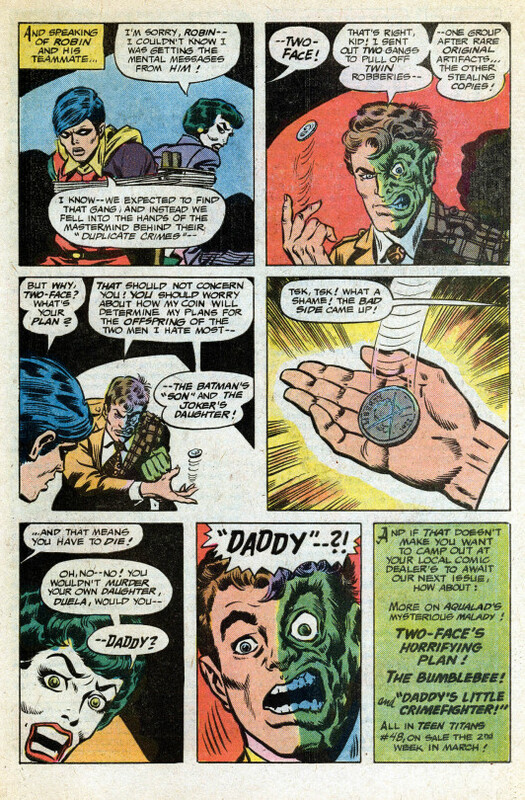 Following his mania, Two-Face tosses his two-headed coin to determine their fate. The scarred side comes up, sealing their fate–and causing the Joker’s Daughter to reveal her great secret: that she’s really the daughter of Two-Face himself! To be continued!